Engineers from the University of Edinburgh and from Italy developed their device—known as a Dielectric Elastomer Generator (DEG) - using flexible rubber membranes. 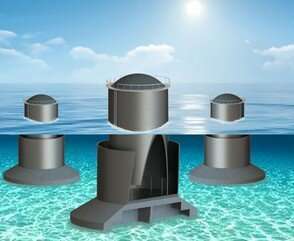 It is designed to fit on top of a vertical tube which, when placed in the sea, partially fills with water that rises and falls with wave motion. Ohhh THAT kind of wave (oceanic). I was expecting something more on the line of a 'gravitational wave', sine wave, etc. 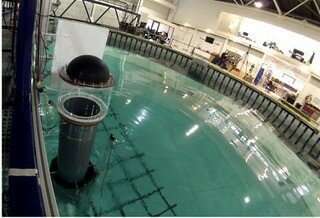 Cheap wave energy has been promised for the past 50+ years. Now we have: "...Engineers say that their design could be used in fleets of low-cost, easily maintained structures at sea within decades..."
They should definitely set up a test installation under realistic wind/weather/fouling conditions off the coast of Scotland. But if the membrane is durable then this might actually work.